Using lime slices to line the clear glass vase holding a floral centerpiece adds an interesting touch to the arrangement. 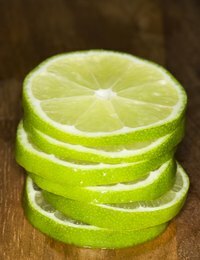 The amount of lime slices you’ll need and the way you slice them will depend on the vase you use for the centerpiece. Vases with a wide opening are easiest to work with. Slice the limes into thin slices to be used along the inside of the vase. For smaller vases, limes can be cut in half, and the rounded base of the limes will provide the interior support needed to keep the limes pressed up against the glass, eliminating the need for a vase liner. Place a smaller vase or plastic vase liner inside the large vase to separate the flowers from the limes and to hold the limes up against the glass. Arrange the lime slices between the outer and inner vase. Add water between the outer and inner vase to help the fruit stay fresh. Arrange flowers in inner vase. Practicing beforehand will allow you to estimate how many limes you will need to create your centerpiece. The same technique works with fruit such as lemons and oranges.